Free Dental Exam + X-Rays and Other Offers! Whether you are looking to whiten your smile, straighten your smile, or take care of chips, cracks, and tooth decay, you can count on our cosmetic dentist. Serving the Woodridge – Naperville area, Dr. Tom Machnowski has the dedication and expertise necessary to enhance the beauty and the health of your smile. Using the latest dental technologies available, you can achieve the smile of your dreams. Below are some of the cosmetic dentistry options available at our dental practice. If you have ever wanted to get a smile that was brighter, whiter, and more appealing, our team can make that happen. Our cosmetic practice here in the Woodridge / Naperville area offers teeth whitening treatments, a safe and effective way to help deal with dental stains and tooth discoloration. Much more effective than whitening toothpastes and over-the-counter whitening systems, professional teeth whitening can whiten a smile by up to 10 shades. Plenty of substances can stain your teeth over time. Coffee, tea, cola, and red wine are all common culprits. If you smoke cigarettes or cigars or use chewing tobacco, that can also lead to a gradual yellowing of your smile. In fact, the natural aging process will result in a certain degree of tooth discoloration given time. Teeth whitening supervised at our Woodridge/ Naperville cosmetic dental practice can reverse this tooth discoloration. The system involves the use of a special bleaching agent that is applied to your teeth. When performed in the office, your teeth are covered in teeth whitening gel and exposed to a special light to help activate the bleaching agent. You may also be given an at-home teeth whitening kit to use as well. This will involve the use of safe whitening gel in a custom-formed tray for your mouth. To learn more about teeth whitening, read our blog: teeth whitening overview. Some of the most common dental problems involve minor chips on a tooth, minor cracks on a tooth, major stains on a tooth or general discoloration, and minor unevenness of a tooth relative to adjacent teeth. While it might seem that each of these dental problems requires a different solution, all of these can actually be addressed using porcelain veneers. At our Woodridge / Naperville cosmetic dental practice we have used porcelain veneers on many patients to achieve a total smile makeover. Porcelain veneers are thin shells made of a special dental ceramic. These thing shells are adhered to the front part of your teeth, masking a dental problem from view. These porcelain veneers are sturdy and stain resistant, and they are also specially color matched to your existing teeth. The best part, however, is that they are semi-translucent just like your actual teeth. This means that once they are in place, they will appear virtually indistinguishable from your actual teeth. Porcelain veneers are a particularly effective treatment for multiple minor dental problems that our dentist likes to use. Patients throughout the Woodridge – Naperville area have turned to Dr. Tom Machnowski to help provide this smile enhancing smile makeover treatment. To learn more about porcelain veneers, read our porcelain veneers overview. In some cases, you may experience major damage to a tooth, whether as a result of an injury or as a result of major tooth decay. In these cases, using a traditional filling will not be enough to address the problem. At the same time, it may not be necessary to use a dental crown to address the problem either. In order to take care of these sorts of dental problems, our dentist uses inlays and onlays. Inlays and onlays are made of a special ceramic material that is directly applied to the cusps (biting surfaces) of your teeth. This dental ceramic is sturdy once it dries and sets, and is also color matched to your existing teeth. This means that after receiving an inlay or an onlay, the treatment will not be noticeable when you open your mouth. Minor chips on a tooth can occur from time to time. Accidents may happen, for example, such as an accidental slip or fall. When playing sports, there is the chance of a mouth injury that leads to a damaged tooth. Sometimes you may knock your teeth against a drinking glass or mug by accident as well, which may cause a chip. Or perhaps there’s a mishap while chewing that leads to a minor chip. These little bits of damage to the teeth can be aesthetically off-putting. To address these issues at our Woodridge / Naperville dental office we sometimes like to use dental bonding. Similar in many ways to inlays and onlays, dental bonding involves the use of a special dental resin that is applied to the damaged part of the tooth. This will help mask a bit of damage and restore the appearance of the tooth as well. Major tooth decay or major damage to a tooth can be more than just an aesthetic problem. In both cases, a tooth that is compromised may be extremely sensitive. You may find it difficult to eat or drink (especially liquids that are hot or cold), and even speaking may be painful in some cases. In these cases, inlays, onlays, and dental bonding are not good options for treatment, but dental crows are ideal. Dental crowns are caps for teeth. These are sturdy, secure, and blend in naturally with your existing teeth. At our Woodridge / Naperville family and cosmetic dental office we use dental crowns in cases where the structure of a tooth has been significantly damaged. The dental crown will be able to provide the tooth with an aesthetically pleasing cover while also offering protection to the tooth from further damage and from substances that may cause acute sensitivity or discomfort. When you have a cavity, it’s important that the damaged material of the tooth is removed and that the tooth is filled. If this is note done, tooth decay may proceed to the interior pulp and structure of the tooth, leading to major dental problems and even major pain and discomfort. Metal fillings used to fill this role in the past, but the future of dentistry is tooth colored fillings. These white fillings are made of sturdy dental resin, the same sort used to fashion inlays, onlays, and dental bondings. They are aesthetically pleasing and just as effective as metal fillings. In fact, many people get their metal fillings replaced by tooth colored fillings given how effective they are. For anyone interested in cosmetic dentistry treatments like teeth whitening and porcelain veneers in the Woodridge, Naperville, Lisle area, our cosmetic dentist can help. The team at Dr Thomas Machnowski’s Dental Office looks forwards to helping you get the smile that you have always wanted. To schedule an appointment, please contact us through our website contact page. 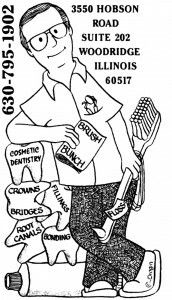 You can also call our general and cosmetic dentistry office at (630-795-1902).